With Yamaha’s release of the MT-09 a few years ago the Japanese company has been slowly adding more and more MT models to create one big MT family. 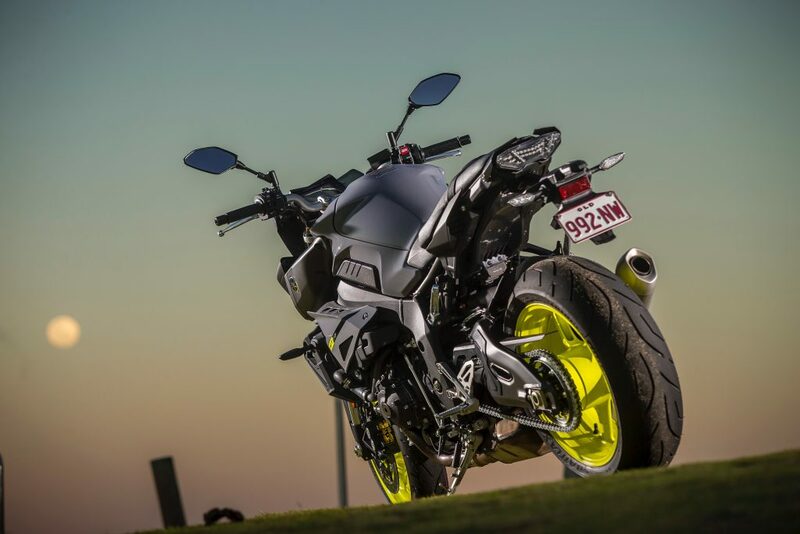 And with the release of the all-new Yamaha MT-10 the family is now complete with a big-daddy. Based on the latest generation R1 it shares many of the same components, but Yamaha insist it is more than just a naked R1, but rather a fully-fledged super naked motorbike. 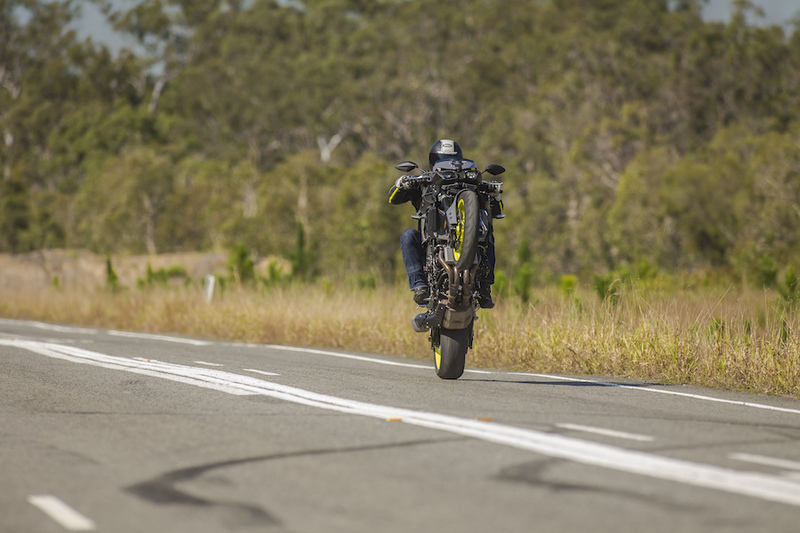 We spent a day riding it around the Sunshine Coast to see if it lived up to its big-daddy hype. Its R1 based 998cc crossplane engine delivers massive levels of linear torque in the low to mid speed range for adrenaline-charged performance. With a claimed 160hp at 11,500 it is around 40hp less than the R1, but what it lacks in outright horsepower it more than makes up for in torque. The engineers have tuned the engine for torque and the MT-10’s 111Nm is almost identical to the R1, but peaks some 2500rpm lower in the rev-range. This gives the MT-10 a mid-range surge that many other 1000cc four-cylinder engines can only dream of. Power is made smoothly and strongly from down low before building into a wave of pure mid-range acceleration, while all the time keeping to a linear power curve. There is enough power to easily lift the front wheel in the bottom three cogs and ample torque to chug the MT-10 out of corners in a gear too high. The mid-range power really lets you play off the engine at more sane speeds instead of waiting for the high-end rush the R1 has – which happens well above legal limits. 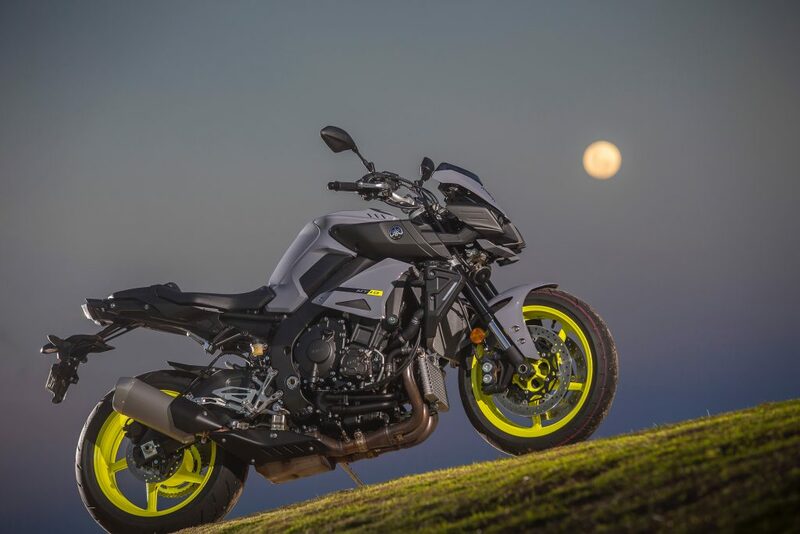 Torque is what gets the adrenaline pumping on the road and the MT-10 has oodles of it. Love the engine! 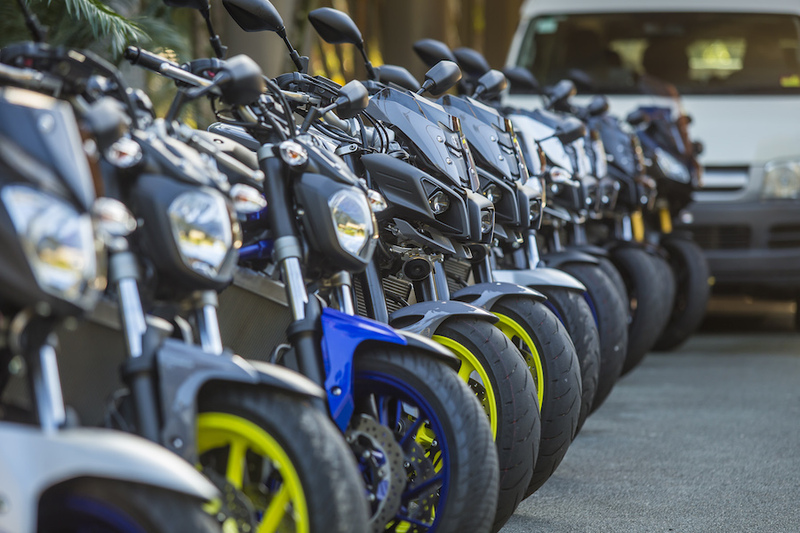 From the seminal MT-09 through to the MT-07, and on to the MT-03, this ground breaking range of naked models is changing the face of motorcycling and bringing new levels of excitement and emotion to the street. Changing the face of motorcycling is a very big call. While it may not be changing it per say – it is definitely adding to the faces, as every MT model front-end seems to portray a face. The MT range really is a family affair; starting from the LAMS-approved MT-03 riders can now stay in the one family and move on up models as their skill and desires increase. The MT-07 is a perfect city basher that is light and easy to handle, while the MT-09 adds a new level of excitement with its great sounding three-cylinder engine. And now the MT-10 tops the family off with a motorcycle that can be absolutely mental through the twisties, yet docile enough to tour on. Each model has it’s own level of excitement and I challenge anyone to not have fun on them – it really is a fun family to be part of. Aggressive mass forward styling with a natural riding position give the MT- 10 a dominant presence that attracts attention and demands respect. 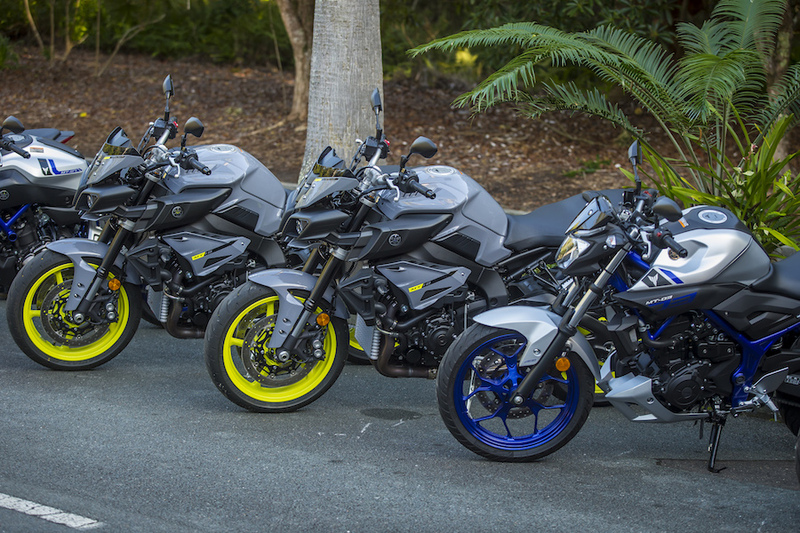 The styling of the new MT-10 will divide onlookers, you are either going to love it or hate it. It is edgy, plastic pieces going off in all directions and looks like it is going to transform into a Decepticon at any moment. I didn’t really like the look of the bike when I first saw it in pictures, but did change my tune once I witnessed it in the flesh. The gray with yellow wheels is the colour-combo pick, purely because with a motorcycle this lary you may as well go all out and add to it – no point trying to hide it. And to be fair to Yamaha nearly all the current super naked motorcycles are all styled like a Transformer – some just not as wild as the MT-10. The seat is plush and the handle bar/footpeg spacing guided my 182cm frame into a comfortable riding position that I could hold for many miles. All three modes can be changed on the fly through the right hand switch block, but be prepared to have your mind blown. 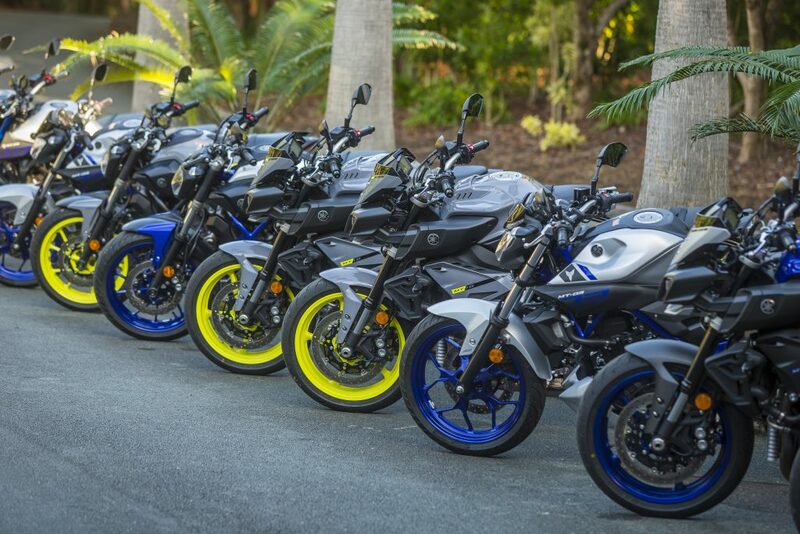 Unlike other Yamaha models ‘B’ is the most aggressive, while ‘A’ is slightly milder and ‘STD’ milder still. I can’t think of another motorcycle where ‘B’ mode is the sportiest, but it is noticeably more aggressive and has quite a direct throttle. On the test ‘A’ mode was the pick – it is the perfect balance between the snatchy throttle of ‘B’ and more doey feeling in ‘STD’. So I am a little confused as to what Yamaha believe is the sportier one. To enable the rider to enjoy the power and performance of the MT-10 in different conditions, it comes equipped with a 3-mode Traction Control System (TCS) that can be deactivated if required. The system works by monitoring any slippage in the rear tyre, and when this is detected the YCC-T automatically controls throttle opening, ignition timing and fuel injection volume to restore rear wheel traction for increased control. The traction control on the MT-10 was unobtrusive and worked well to keep the motorcycle balanced and driving forward on corner exit. The three-levels can be changed on the fly, however, it can only be deactivated at a standstill. Being able to deactivate while on the move would be a plus. 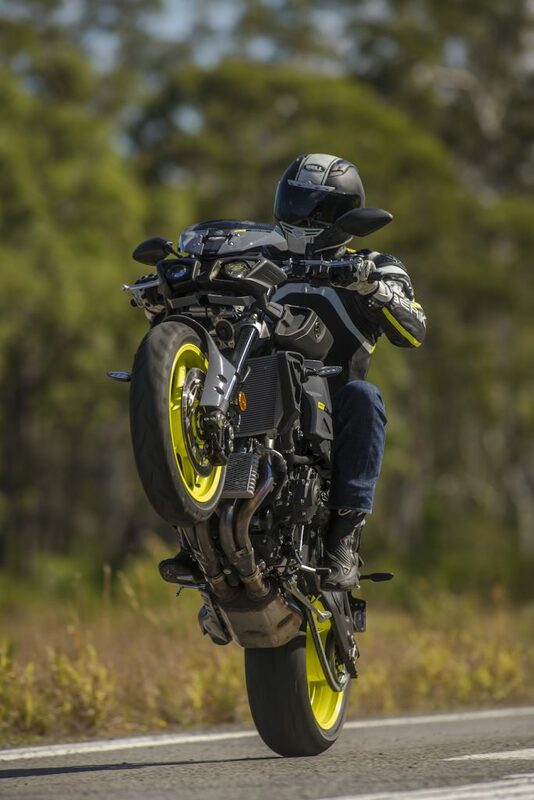 One great feature of the system fitted to the MT-10 is that it allows you to pull perfect wheelies, which many other traction control systems won’t allow. The reason for this is that when the front wheel comes up the system thinks the rear is spinning – purely because the rear is accelerating while the front is remaining at that speed or slowing. The MT-10 has overcome this problem. This allows you to show off on cue without worrying about the electronics spoiling your fun, and this motorcycling really does bring out your inner hooligan. 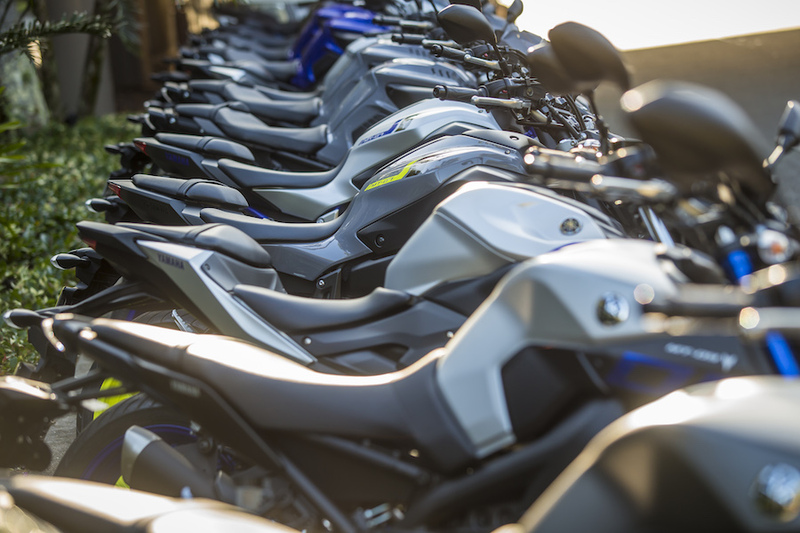 With its natural riding position, high torque engine and sophisticated chassis, the new MT-10 has the potential to cover long distances – and with its accessory-friendly chassis, it can be equipped with a range of Genuine Yamaha Accessories such as a high screen or side bags to prepare you for any journey. 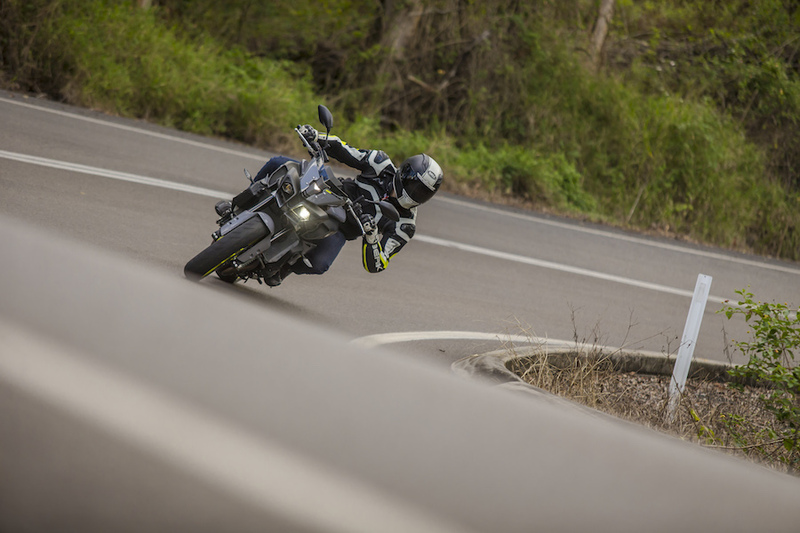 For more relaxed and enjoyable riding the new MT-10 comes equipped with a cruise control system that can be activated in 4th, 5th and 6th gears between 50km/h and 180km/h. 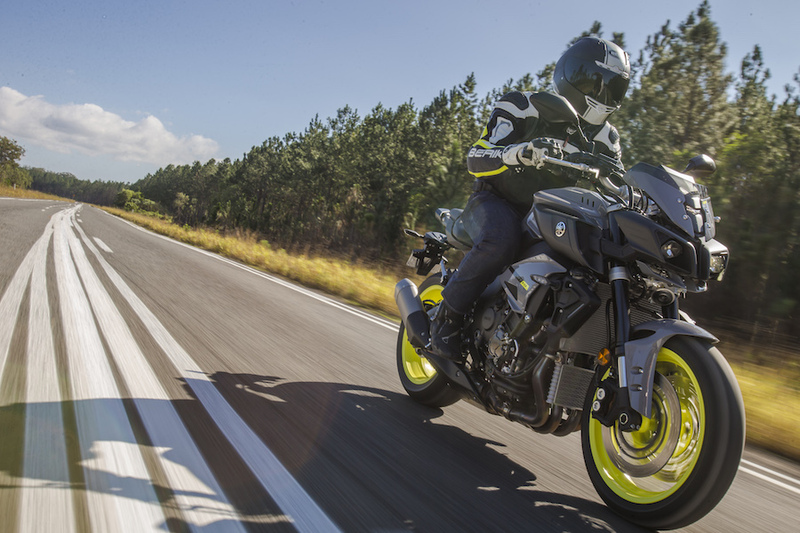 There is no denying the fact that the MT-10 could be used as a mile cruncher – matter of fact an MT-10 Tracer could possibly be a real goal kicker for Yamaha. There is no word on one yet, so for now you have to option the accessories yourself. The front offered some wind protection, but a screen would be a welcomed addition on long highway commutes. The cruise control worked well and offered a resume function and speed adjustment increments. My only gripe with the system is that the dash does not show you the speed set or speed adjustment. Yamaha, fix that and the system will be faultless. Another genuine accessory available that is a must is the quick shifter. I believe it should be standard, but am aware everything comes at a cost. 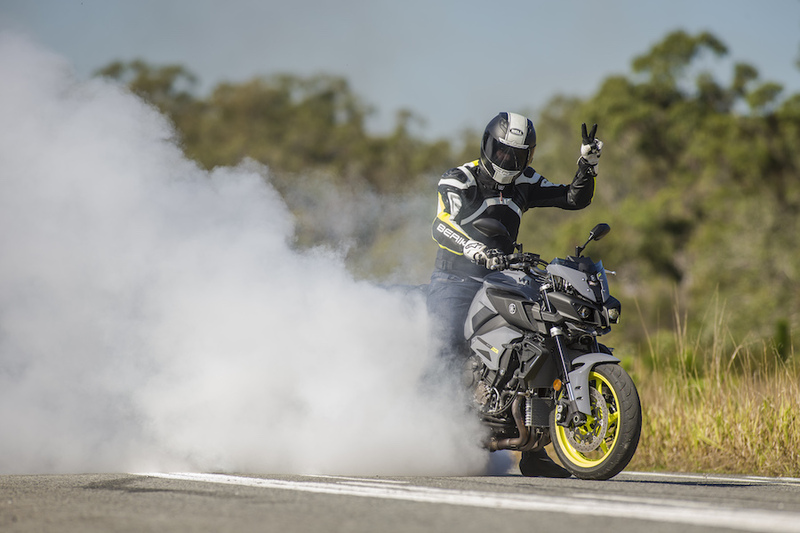 The new MT-10 runs with an ultra-short 1400mm wheelbase – a full 35mm less than the nearest competitor, making it the most compact one-litre naked bike in its class. Combined with the extra-long YZF-R1 type aluminium upward truss swingarm and subtle revisions to the chassis geometry, the 1400mm wheelbase gives light and neutral handling performance together with outstanding straight-line stability during acceleration. From the moment you swing a leg over the MT-10 it is obvious that it has a short wheelbase – it feels as if you are siting right over the front wheel. At slow speeds the front-end felt a little heavy to turn – it was no deal breaker, but just something I noticed. Once the speeds rise the short wheelbase really adds to the flickability and light steering nature of the MT-10, hardly any effort is needed to change direction at high speeds. Sometimes this can throw up the ole’ headshake under hard acceleration, but the electronic steering damper and geometry must work as I didn’t suffer one all test. The MT-10 is fitted with dual 320mm diameter floating front discs that feature radial-mount 4-pot opposed piston callipers with sintered pads. This high-specification design is one of the most powerful and effective systems fitted to a naked bike, and gives the MT-10 rider an excellent balance of controllability together with outstanding braking power. The MT-10 brakes offer great feel and an abundance of stopping power, but they aren’t of the same quality and specification fitted to other naked bikes – especially the Euro’s which all sport Brembo anchors. If they want to claim the title as the most powerful and effective a higher spec-braking package will need to be fitted. But in saying that, if you’re not into eye-bleeding retardation these offer a softer initial bite than the Brembo’s and a more progressive lever action. The ABS is effective and also stops the rear wheel lifting under hard braking. The ABS system cannot be turned off. wheel for a high degree of controllability. It’s good to see that Yamaha have not skipped on the MT-10 suspenders and chose to fit the same units that work so well on the latest generation R1 – admittedly tuned for a more road-oriented ride. They are softer than the superbike and soak up crappy roads instead of knocking your fillings out. All this helps to keep the MT-10 more balanced and gives the rider more confidence to attack on the road. Superbike suspension is too stiff for the road and I reckon any R1 rider would be quicker on the MT-10 through their favorite twisities than on their R1. The key feature on Yamaha’s A&S clutch is its specially designed slanting cam that is located between the clutch boss and the pressure plate. This mechanism augments the force of the clutch springs and consequently allows the use of lower rate clutch springs in the MT-10, giving a much lighter feel at the clutch lever. The MT-10 clutch feel is definitely on the lighter side of clutches for a 1000cc motorcycle. It offers good feel and a progressive actuation through its travel. 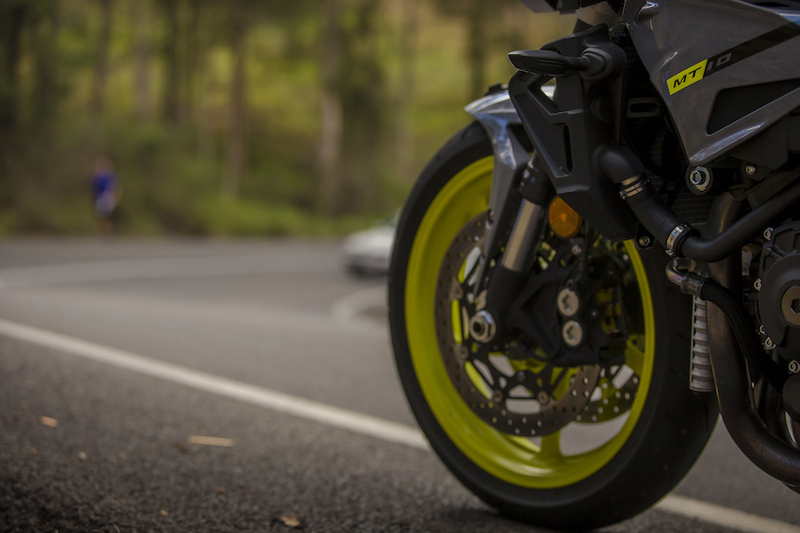 The slipper-clutch works well and even under extremely harsh down-changes the MT-10 remains stable, straight and shows no sign of rear-wheel chatter. The gearbox is precise and smooth, but as I said earlier does lack a quick shifter from the factory. To complement the MT-10’s advanced specification, this high performance one-litre naked bike is equipped with a new LCD multi- function instrument panel. The clear and easy to read design includes a digital speedometer, bar display tachometer, fuel gauge, odometer, gear position indicator and more. A shift timing indicator light can be adjusted to suit the rider’s individual preference, and there is a range of pictogram lamps that clearly display cautions, warnings and functions that are in use. No real arguments from me in the dash department, it is easy to read and offers a plethora of information. The fuel gauge is something every motorcycle should have and considering the MT-10 may be used for touring it is good to see it has one. The only thing I would like to see on the dash is the speed that the cruise control has been set at – really the only bit of information the MT-10 dash is missing.